<< Back | Home > Machinery - Vacuums • Polishers • Scrubbers • Extractors > Floor Scrubbers > Ride On Scrubber Dryer > Windsor Ride on Floor Scrubbers > Windsor Saber Glide 28"
The Saber Glide 28 has the speed of a rider with the maneuverability of a walk-behind. Saber Glide’s operator’s compartment offers the comfort and familiarity of an automobile. Full control of the machine is in clear sight and at the operator’s fingertips. From the compartment, the view of the work area is unobstructed for safer, more productive cleaning. The control panel is intuitive and features one-button scrubbing for reduced operator training. Saber Glide provides a tight turning radius, fits into a standard elevator and will easily drive through a standard 36-inch (91 cm) doorway. 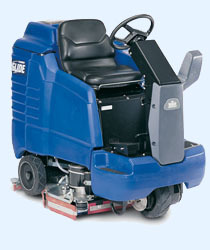 Daily maintenance operations on the Saber Glide have been simplified to increase productivity.